When she’s once again passed over for a promotion at work, Zoe decides to take the big leap and go for her dream. She quits, gives up her fancy digs, and buys a fixer-upper diner in a shady part of town. To keep above water during the renovation, she buys a used food truck to serve the downtown and waterfront of Mobile, Alabama. Zoe starts to dish out classic Southern food—but her specialty is her deep-fried biscuit bowls that blow traditional bread bowls away. After a promising start, things start to go downhill faster than a food truck without brakes. First, someone tries to rob the cash register. Next, Zoe is threatened by the owner of a competing food truck for taking their spot. And when the owner ends up dead inside Zoe’s rolling restaurant, Zoe and her sole employee, Ollie, find themselves hopping out of the frying pan into the fryer. They need to find the real killer, before both of them get burned. Zoe Chase has ended her career at a bank, and has been trying to ditch her boyfriend and building her life as a food truck owner. She works along side some colorful characters from a local homeless shelter where she donates her unused food. 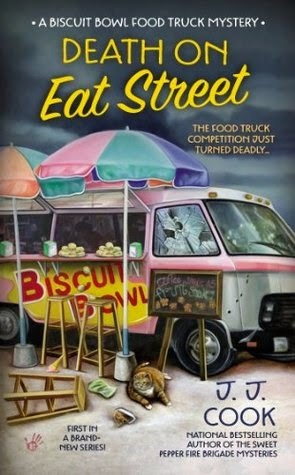 When another food truck owner winds up dead and stuffed in Zoe's truck it's up to Zoe and her friends to figure out what happened? This book was awesome we got to meet all sorts of people, learn about the various characters and how they worked together for a common goal, to find the truth. In the midst of all this is a Thomas Jefferson recipe that went missing for Crème brûlée, many people seem to think Zoe has the recipe and she spends a great deal of the book finding out what is so special about this missing recipe, and who has the most to gain by it being missing. I enjoy reading books by J.J. Cook and have been a great fan since the fire brigade series, and this one didn't disappoint either. It really pulled you in seeing how J.J. wove the story together, can't wait to see what is next for Zoe and whether this recipe will appear again! This giveaway is U.S.A. only. 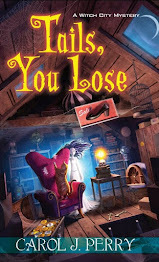 I have one copy of this book to giveaway to a luck winner all you have to do is list your favorite cozy author. Easy peasy! Please include your email address so that I can contact you. Good luck everyone! cool good luck :) I love Janet Evanovich in the beginning with Stephanie but she has written so many that are similar. 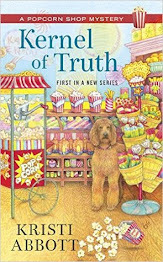 Joanne Fluke is one of my favorite cozy authors. I also like Amanda Lee/Gayle Trent and Elizabeth Craig. I love cozy mysteries!